Government of Oman is highly investing in infrastructural projects for the development of the country as a result of which construction sector is growing rapidly. Construction activities in the areas of public infrastructures, transportation, residential, and commercial buildings are driving the demand for air conditioning systems in the country. According to 6Wresearch, Oman's Air Conditioner market is projected to reach $410 million by 2021. In Oman air conditioner market, centralized air conditioner has captured the majority share and is further projected to maintain its dominance in the years to come. Demand for window air conditioner has decreased due to the increasing acceptance of mini-split air conditioner in residential sector. Amongst all the end user applications, residential sector accounts for the largest market share in Oman air conditioner market. With the increasing number of residential projects such as Al Khuwair Gardenns, Al Ghubrah Residential, Shinas, Al Hail Residential, and Al Hail Waterfront, the market for air conditioners especially mini-split and ducted split would grow. The report thoroughly covers the air conditioners market by AC types, applications, and regions. The report provides the unbiased and detailed analysis of the on-going trends, opportunities/high growth areas, market drivers, which would help the stakeholders to decide and align their market strategies according to the current and future market dynamics. • Historical & Forecast data of GCC Air Conditioner Market for the Period 2010-2021. • Historical & Forecast data of Oman Air Conditioner Market Revenue for the Period 2010-2021. • Historical & Forecast data of Oman Window AC Market Revenue & Volume for the Period 2010-2021. • Historical & Forecast data of Oman Split AC Market Revenue & Volume for the Period 2010-2021. • Historical & Forecast data of Oman Packaged AC Market Revenue & Volume for the Period 2010-2021. • Historical & Forecast data of Oman Free Standing AC Market Revenue & Volume for the Period 2010-2021. • Historical & Forecast data of Oman Cassette AC Market Revenue & Volume for the Period 2010-2021. • Historical & Forecast data of Oman Centralized AC Market Revenue for the Period 2010-2021. • Historical & Forecast data of Oman Centralized AC Market Revenue, By Components for the Period 2010-2021. 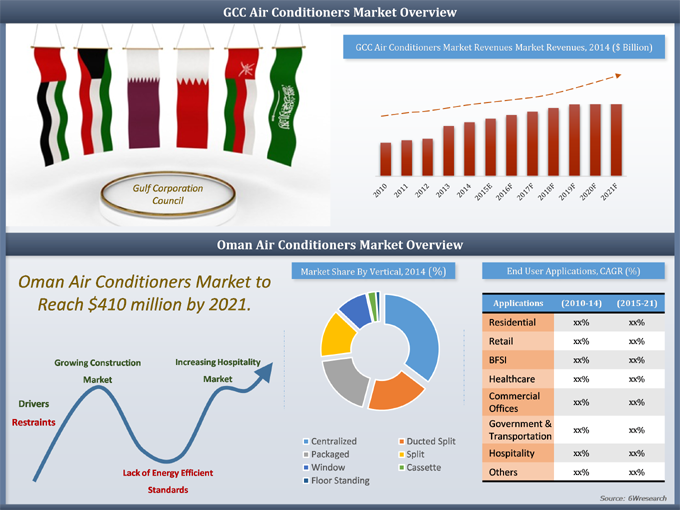 • Historical & Forecast data of Oman Air Conditioner Application Market Revenue for the period 2010-2021. • Historical data of Oman Air Conditioner Regional Market Revenue for the Period 2010-2014. • Market Size & Forecast of Oman Air Conditioner Regional Market Revenue until 2021. 19.4 GREE Electric Appliances Inc.
19.8 Samsung Electronics Co. Ltd.
Oman air conditioner market has been growing at a constant rate on account of increasing infrastructures in the areas of hospitality, residential, retail, commercial buildings, etc. With the growing population, Oman has been continuously investing into building up of world class infrastructure and trading hubs. Expansion of Muscat airport, upcoming Liwa city project and large number of mega projects are underway, which are projected to create high demand for air conditioners in the country. Oman air conditioner market report has been segmented into AC types, end user applications and regions. The major companies in Oman's air conditioner market include- York, Carrier, Gree, Trane, Daikin, Samsung, Zamil, Fujitsu General, Mitsubishi and LG.